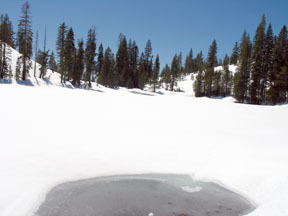 Start Small, snow-covered road on the south side of Hampshire Rocks Road (old Highway 40 or Donner Pass Road) and 0.1 mile west of the Big Bend Ranger Station (closed in winter). From eastbound Interstate 80, take Big Bend exit, turn east (left) onto Hampshire Rocks Road, and drive 0.15 mile to the trailhead. From westbound Interstate 80, take Big Bend/Rainbow Road exit, turn left and go under the highway, turn right onto Hampshire Rocks Road, and drive 1.2 miles to the trailhead. Be aware that there is no well-defined parking place. In spring you will find parking nearby along the highway. Other times you will have to search for a legal place to park. Continue beyond Huysink Lake to Peak 6966 to transform a good tour into a great tour. Beyond the lake relatively easy navigation with a map takes you to the broad summit of Peak 6966 and its grand vista. The first thing you notice upon reaching the summit is massive Snow Mountain to the southeast. Also easy to identify is Castle Peak to the northeast. 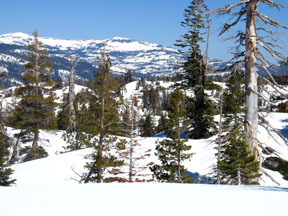 Off in the distance between these two icons are the many peaks that lie between Sugar Bowl and Squaw ski resorts. 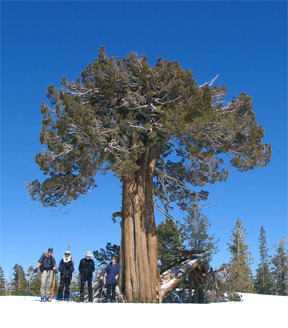 A landmark along the route, only 0.1 mile from Peak 6966, is the unmistakable "broccoli tree." Yep, it looks like a massive stalk of that cruciferous vegetable. Snowmobile use in this area is low in terms of overall numbers, but cabin owners near the start often track the road. 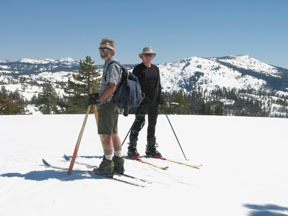 Fortunately a late March or early April tour will allow you to avoid the machines and enjoy the best snow conditions the Sierra has to offer. Why is this so? Because at least one creek cuts across the access road during the spring melt and forms a barrier to snowmobile travel. Of course this will require you to take off your skis and cross. 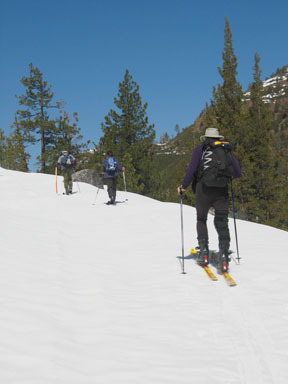 Keep in mind that while spring-time brings the consolidation of the snowpack and the melt-freeze cycle creates wonderful corn-snow, this tour is entirely on north-facing slopes and begins at only 5750 feet elevation. Be sure to pick a fair-weather spring day when you know that the snow will thaw for your return descent. Mid-winter the best time is after a cold storm when the snow remains soft. An alternative return route is described in the Huysink Lake and Peak 6966 Loop tour. It's definitely a more challenging route that combines open slopes and dense woods with a need to pay attention to your navigation. From the trailhead (1) ski south and then west on a snow-covered road for a total of 0.4 mile until you reach an obscure road junction (2). Take the road to the south (left) and follow its convoluted path to the southwest for 0.8 mile until you reach the railroad tracks (9). Waypoints 3 through 8 are additional waypoints provided for this section. Take off your skis and cross the railroad tracks. Be aware that in heavy snow years the banks on both sides of the tracks can be difficult to negotiate. You may find a shovel useful. It goes without saying that you should exercise extreme caution when crossing the railroad tracks — use both your eyes and ears. After crossing the tracks, continue skiing southwest and then west on the snow-covered road for a total of 0.4 mile until you reach a sharp turn in the road (11). Waypoint 10 is an additional waypoint provided for this section. Continue south on the snow-covered road for 0.5 mile until you reach Huysink Lake (12) located in a saddle. You can see the saddle as you approach the highest point of the tour a short distance before the lake. Loop around the north side of a small knob and then ski slightly south of east for a total of 0.6 mile until you reach a flat area between two higher areas (13). Climb gradually east for 0.2 mile until you reach the lone, large, broccoli tree (14). Continue slightly south of east for 0.1 mile, crossing a small dip, until you reach Peak 6966 (15). Retrace the route for 3.0 miles back to the trailhead (1).